Home » Pony Mania Part II: All About Pony Finals! It goes without saying that Pony Finals is the year’s most exciting event for competitive pony riders. However… it’s actually just generally exciting, for parents, grooms, trainers, grandparents- heck, even for the animals! The ponies are shapely, shiny, stunning examples of health and good conformation, all groomed to perfection. The child riders are like consummate professionals. They are all decked out in their breeches and jackets, hair perfectly arranged, their eyes focused on their course, their mission. Of course, the best horses, riders, and trainers attend but there are great tack shops, social events, sportsmanship awards, horsemanship competitions, and USHJA clinics. Most people who’ve gone will tell you- if you can qualify, and if you can get there- GO. It’s a great experience. In order to show at Pony Finals, a pony must qualify. If you are new to showing ponies and haven’t yet read last week’s post on pony hunters, I recommend checking it out first to get some background. It will provide the basics about pony sizes, divisions, rules, and how the classes work. Qualifying for pony finals is thankfully fairly uncomplicated, compared to qualifying for some other types of Finals. It’s really important, as with all things at USEF-regulated competition, to remain up-to-date in your knowledge of the rules and to have the required memberships up to date. The pony, the pony’s owner, and the pony’s rider must be USEF and USHJA members. Qualification has changed a bit in the past few years, but we at Horse Show Leases are in the know! 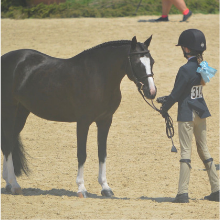 To qualify for pony finals, the pony must be Champion or Reserve Champion in the Regular or Green Ponies, regardless of whether it is at an ‘A’ or ‘AA’ show. For Regular ponies, the qualification period is between July 2 of the previous competition year and July 1, of the current competition year. So, that would mean, for example, July 2, 2017 – July 1, 2018. The qualification period is relatively short for Green ponies- between December and June of the following year; for this year: December 1, 2018 to July 1, 2019. So we are halfway done already! This is because, as we know, Green ponies are only eligible to compete in that division during one competition year. Remember from last week’s post that Green Ponies may only compete and maintain eligibility in that division for one year. During that year, they may also compete in Regular Ponies if you so choose. Technically then, a pony could qualify for Pony Finals in both the Green and Regular ponies. However, at Pony Finals, you have to choose one of the two in which to compete. Of course, most would choose Greens, since that is by definition less experienced ponies, and since they can only do it that first year. In fact, a Green pony can actually qualify by being champion of the Regular Ponies and still elect to compete in the Greens at Finals. There is also the Pony Jumper Championship at Finals, a great addition to the event. Rules are slightly different for that, and we will cover them in a subsequent blog. 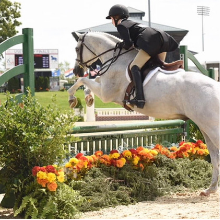 And finally, riders may also qualify for the Pony Medal, by earning at least 30 points in the Marshall & Sterling/USEF Pony Medal, which is an equitation class, and therefore it is the rider who qualifies, rather than the pony. Another fun fact is that the rider who qualifies the pony does not have to be the one to show it at finals, it’s ok for another rider to do so. This is because it is the pony itself, rather than the pony/rider combination, that qualifies. Likewise for equitation, it is the rider that qualifies, so they may compete on a different pony at Finals if they so choose. The Model Phase is held first. This class is judged “in hand,” which means that the ponies get held by the rider, rather than ridden, and posed for the judge to compare their conformation, way of moving, and soundness. Ponies must be groomed to perfection and riders where all their best attire. They usually try to “pose” the ponies in a complementary position, something riders and trainers work on in advance. 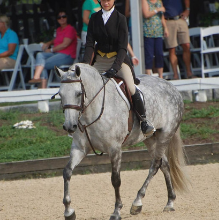 The Under Saddle Phase is a typical under saddle class, requiring ponies to show at a walk, trot, and canter in both directions. Of course, it’s a bigger class than what most ponies and riders will be accustomed to, and standards are very high. Judges will have to really scrutinize ponies, and they may be asked for an extended trot. They should stop easily and stand quietly- they must showcase excellent manners. The Over Fences Phase requires ponies to compete over a minimum of eight fences at the required height for the pony’s section ( which if you remember from last week’s pony hunters post is: 2’3″ – small, 2’6″ – medium, 2’9″ – 3′ – large). The courses are often a bit longer than eight fences, and they will be highly decorated, in a highly decorated ring. The course won’t feel like a typical hunter course, requiring a bit more maneuverability from the pony. The best way to prepare for this, as with all things, is with the guidance of an educated and experienced trainer. There are a number of other awards at Pony Finals, such as awards for the Ten & Under Awards for the top ten overall riders in Greens and Regulars who are under the age of ten. Also, the Betsy Fishback Memorial Trophy for the best turned-out (groomed) pony. Another one is the Mindy Darst Perpetual Trophy for equestrian excellence, given to the rider most likely to become a top professional. Two really interesting awards are the Emerson Burr Horsemanship Award and the Buttons ‘N’ Bows Sportsmanship Trophy. These are really great awards because have nothing to do with the results of the actual ponies or classes, and they highlight other great values for the sport. For Emerson Burr, riders take a written horsemanship test, which 20 or fewer questions. This asks fairly basic horsemanship questions, but if you are feeling very ambitious there are online resources to prepare for this, like the USHJA Horsemanship Quiz Study Guide. The top competitors in the test are move on to the hands-on phase. Here, the judges ask them to actually demonstrate their horsemanship skills. They might do so by showing that they can groom a horse, find the heart rate, detect signs of colic, or identify conformation faults. The awards are each given out in four age groups: 8 and under, 9-11, 12-14, and 15-17. Each Emerson Burr winner during Pony Finals will receive a $500 grant to be used towards educationally related expenses. The Buttons ‘N’ Bows Sportsmanship Trophy celebrates a rider exemplifying “integrity, sportsmanship, honor, courage, good temper and unselfishness.” They look for someone who is a helpful, selfless leader with a great attitude above all else. Candidates for this award must be nominated, with nominators submitting their letters of recommendation to the USEF. Then judges select and announce the winner during the show. The nomination letter, which should cite specific examples, and goes to Natalie Norwood at USEF. This can happen via email, fax or mail to USEF by the deadline in the prize list. According to Natalie Norwood, head of Pony Finals for USEF, quality is more important than quantity for nomination letters. They want to hear all the details about how nominees contribute to their barn community. If you are as excited about getting to pony finals as we are, it’s time to get showing! The best practice takes place under pressure, so get in the show ring as much as possible, even after you are qualified. And hone those horsemanship and sportsmanship skills! 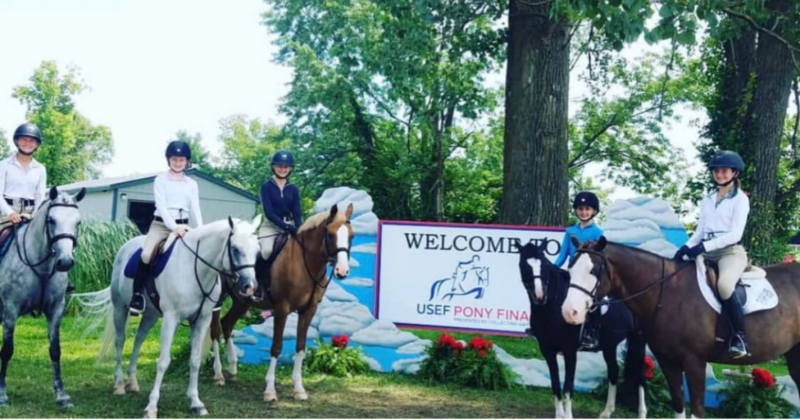 Call Alicia Wilkinson to start on your Pony Finals path!